Condition: This phone is like new condition minor used phone is fully functional. clean esn It work with T-mobile Comes with: phone battery battery cover Generic wall charger. Add cool new capabilities that aren’t available on any other smartphone. Enjoy TV on the go, add cool, new capabilities with Moto Mods. MOTO MODS™. 2 Force Edition. Shoot professional-looking photos with enhanced depth of field. 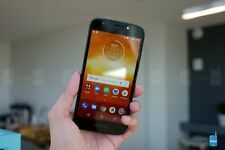 Motorola Moto Z Force 2nd Generation. Lunar Grey. Family Line. Great Deals On. No Contract Required. At our discretion we will repair or replace the item. Storage Capacity. Screen Size. Motorola moto e5 play. Just look at moto e. Select Moto Experiences. Keep your phone protected with a water-repellent coating. Make room for more photos, songs, and videos with expandable storage. Hearing Aid Compatibility. 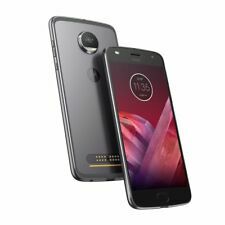 Motorola Moto Z2 Force (XT1789-04) 64GB Super Black (AT&T) GREAT . Motorola Z Force. Motorola MOTO Z Force 2nd Generation. Screen Size. Will Only work on AT&T, NOT unlocked. New, Used, & Refurbished. SIM card not included. All original parts, everything works 9/10 great physical condition, never used, open box. Everything works. You get exactly what you see in the pictures. This device is missing it's back cover. Motorola Moto Z Force 2nd Generation. Lunar Grey. Family Line. Item has scratches and scuffs. Overall Good Condition. Great Deals On. Display Technology. No Contract Required. 32GB ROM /3GB RAM. 1.4 GHz Octa Core processor. New in a box. Condition: This phone is good condition some sign used phone is fully functional. clean esn It work with T-mobile Comes with: phone battery battery cover Generic wall charger. Motorola Moto Z Force 2nd Generation. Item shows significant signs of use, heavy scratches on display and body. Family Line. New, Used, & Refurbished. Screen Size. Display Technology. No Contract Required. Model Moto Z2 Force. Type Smartphone. Item shows significant signs of use, heavy scratches on display and body. The phone shows significant signs of use, heavy scratches on display and body. New, Used, & Refurbished. Model Moto Z2 Force. Touch Screen Yes. Item has scratches and scuffs. Overall Good Condition. Great Deals On. SIM card NOT included. You will receive the listed phone. Product Identifiers. Has an adhesive screen protector on that has just been partially taken off. Motorola Moto Z Force 2nd Generation. Lunar Grey. Used Condition - Phone shows significant signs of use, heavy scratches on display and body. Item shows significant signs of use, heavy scratches on display and body. The majority of these phones are in good condition with minimal to normal wear. A few of them are in fair condition and only one or two might be considered poor condition. 1 Phone DOES NOT have a battery but it is fully functional and was also reset and cleared of all content. I believe she had this between Dec 2007 through the end of 2009. There does not appear to be any cracks in screen but it does show scratches on outer case. My family and I are in the unenviable process of going through our grandparent’s estate as well as our parent's possessions. 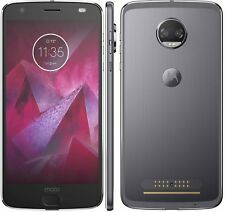 Model Moto Z2 Force. Clean ESN, 100% fully functional. Item has scratches and scuffs. Overall Good Condition. Great Deals On. Product Identifiers. At our discretion we will repair or replace the item. Moto e5 Plus Unlocked Cell Phone 32G Blue Border on Black. Condition is Used. Shipped with USPS First Class Package. Motorola Moto E5 PLAY 5.2 HD 16GB ANDROID GREY T-Mobile SMART Phone. Shipped with USPS Priority Mail. Motorola C168i features Free Motorola C186i. ( Plan includes a total of 2000 units, each unit can be used for any combination of Talk/Text/Data.). 2000 Talk or. 2000 Texts or. 2000 MB Data (Includes MMS). Condition: This phone is good condition some used phone is fully functional. clean esn It work with T-mobile Comes with: phone battery battery cover Generic wall charger. Nice shape. This is a basic flip phone compatible with T-Mobile. It is 2G. It comes with a charger. Will only get a signal where 2G coverage is strong.